The Shadow is a joint development between American manufacturing company General Dynamic Land Systems and the Marine Corps War-fighting Laboratory for the USMC Reconnaissance, Surveillance and Targeting Vehicle (RST-V) program, in corporation with the Defense Advanced Research Agency (DARPA) and the Office of Naval Research (ONR). 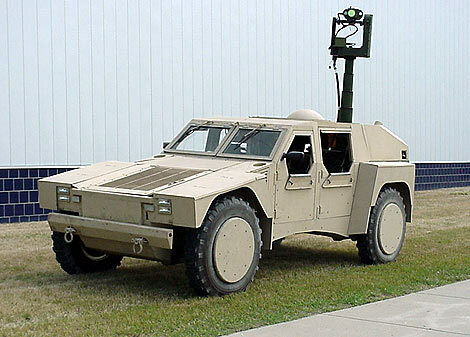 In 1997, ONR and DARPA awarded contracts General Dynamics Land Systems (GDLS) and Lockheed Martin Missiles and Fire Control to develop a new reconnaissance vehicle that could be developed in a number of mission variants, currently fulfilled by the Humvee. In 1999, GDLS was awarded a contract for the second phase of the Shadow RST-V program, covering the build of four demonstrator vehicles and an option for 39 additional vehicles. In May 2005, GDLS was awarded a contract for the upgrade of the RST-V. The upgrade supports continued operational evaluation of the vehicle as a utility carrier, prime mover and electrical generator for various US Marine Corps applications. The upgrade included a 30kW export power capability generator by the vehicle’s hybrid electric drive, which could power battlefield loads such as the Unit Operations Center and radars. The vehicle was evaluated in an operational environment in early 2006. Since then there has been no further public information and the vehicle is not one of the six vehicles selected for the The Joint Light Tactical Vehicle (JLTV) program to replace the Humvee, which as of 2015 is still running. The term ‘hybrid’ describes a combined power and energy storage system. Power for the vehicle is generated by a Detroit Diesel type 2.5 litre DI-4V engine. This powers a 110kW Magnet Motors permanent magnet generator that drives the x4 50kW Magnet Motors (x1 per wheel). The vehicle has twin SAFT Li-Ion battery packs that can be used to power the Magnet Motors instead of the Detroit Diesel engine, giving the vehicle not only a greater fuel efficiency but a stealth capability whilst being used in the Reconnaissance role. The vehicle is fitted with a pneumatic suspension, which can reduce the dimensions of the Shadow by allowing the tyres to be pulled in and the height of the vehicle to be dropped so the base of the vehicle is 0.1m off the ground. This is to enable transport by V-22 tilt rotor. The Shadow has a crew of four. 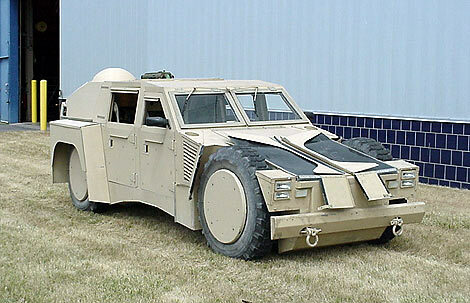 They can be protected from machine gun fire and optional protection from mines, which includes Bullet-proof windows thanks to the vehicles light weight due to its all aluminium body. The vehicle is reported to have a large internal cab due to the use of its hybrid engine, which requires lesser mechanical parts than a standard engine. This means various electronic equipment can be carried for different roles. The vehicle is capable of carrying a C3I (command, control, communications and intelligence) suite and a telescopic mast which can reach 3 meters in length for the purpose of mounting a sensor developed by GDLS. The sensor includes day and thermal channels for locating targets and a laser designator to “paint” the target for a third party, be it artillery, a tank or aircraft to attack. The vehicle was reportedly capable of serving as – forward observer, forward air control, reconnaissance, light strike, battlefield ambulance, air defence, logistics, personnel carrier, anti-armour, mortar weapons carrier and Command Post. Either a 7.62mm or 12.7mm Machine Gun, 40mm grenade launcher, Objective Crew Served Weapon (OCSW), Javelin or TOW anti-tank missile systems can be mounted on the roof hatch. The vehicle can not be found in either the product listing or press releases on GDLS’s website. This would indicate that the vehicle has not been selected as winner for the RST-V program, though vehicle has been marketed at military shows.